The problem with loving an unconventional book is that it's so hard to find other books like it. This is the problem with me and Mark Z. Danielewski's 'House of Leaves' (which I swear I'm going to review one day...). I feel like I'm on a constant quest to find books that move in the same circles as 'House of Leaves,' and what books I do find rarely come close. 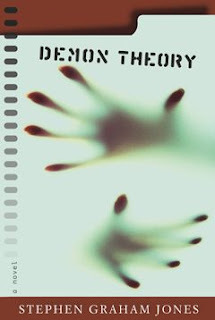 Like Stephen Graham Jones' 'Demon Theory,' for example. I had really high hopes for this one. The thing I loved most about 'House of Leaves' was the faux film analysis that took up the bulk of it. 'Demon Theory' features a similar conceit. It operates both as an analysis of a fictional horror movie trilogy, but also as a rumination on the history of horror films. This book has footnotes up the wazoo. Unlike in 'House of Leaves' the footnotes are all factually accurate, and actually really interesting. Well, interesting if you have more than a passing interest in horror and or films, that is. The problem was that instead of being on the bottom of the page, they were all listed in the back of the book. I'm a lazy reader guys, I couldn't be bothered flicking to the back of the book every five minutes. There were a lot of them, but I still think it would have been better to have them in the main text. But that's a layout thing, and there's every chance that Jones had no control over it. As for what he did have control over... Things start in a promising enough way. It's Halloween, and a bunch o kids are at a party when one of them gets a phone call from his creepy diabetic mother. So it's off to a creepy, middle of nowhere farmhouse! Things, as I'm sure I don't need to tell you, do not go well. I don't know, maybe it's just that I went into the book expecting (hoping) to find a more subtle creepy brand of horror, but for the most part the over the topness of the books horror elements just had me rolling my eyes. Plus, the characters were insanely two dimensional. Which, ok, on the one hand I get it. Jones clearly went to great lengths to make his trilogy of fake demon movies feel exactly like a classic horror film, which included cardboard characters. But the difference between books and movies is that its just so much easier to create "real" characters in books. I feel like he really missed an opportunity with his mostly forgettable cast. My other major gripe isn't entirely Jones' fault. I went in to this looking for a 'House of Leaves-esque' experience, and that's not what Jones' was trying to do. But still. 'House of Leaves' did not just offer up a line by line summery of the fake documentary it revolved around. It analysed it, it linked it to philosophic schools thought and compared it to other films and critiqued the film making techniques used. And if that sounds too pretentious and post-modern to be stomached, well, it kinda is. But I loved it! In Demon Theory the three movies it features are just given summaries, with no kind of depth. I feel like Jones wasted the 'analysing a fake movie' gimick a bit. Sure, it helped tie the narrative to the history of horror films that he also had going on, but I just wanted a lot more from it. The plot of the fake movies themselves started out easy to follow and end up just completely batshit insane. I had almost no idea what was going on by the end, but lets be honest, that's how most horror movie franchises go. I do think my reaction to this book was heavily influenced by my wish for a second 'House of Leaves.' So if you can go into it "blind," then you might get more out of it than me.